I love being a mum and of course I love shopping for my little boy. Baby Company is having a grand fair starting today until Sunday. Enjoy discounts up to 70% off! So go go go! How cool that they have water stations scattered around the fair?!? Quinny & Maclaren baby strollers on sale! 20% off! I have a saya sling and I love it! This one caught my eye. Reusable diapers! They have a lot of colours to choose from. The busiest booth at the fair! What are they selling? Cute printed mats! Eli have this baby seat from Uratex. 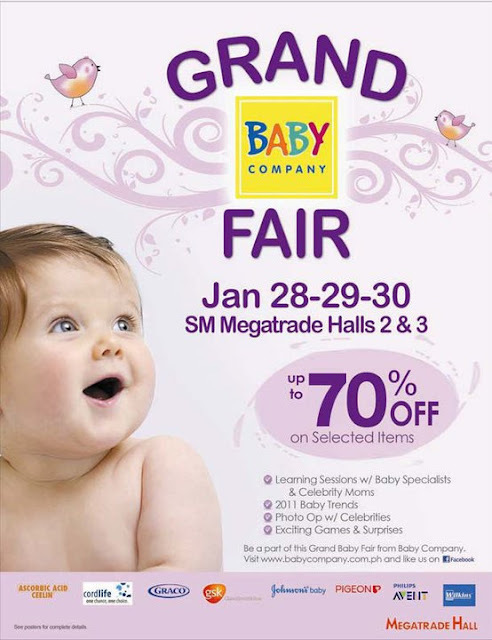 Head to the Grand Baby Company Fair at the SM Megatrade Halls 2 and 3 now. A huge THANKS to Jane for inviting me to the fair! hi.. i saw the play mat that was offered last january 28-30. But when i got there, it was already out of stock. I was just wondering if you have any idea, where can i buy it now? Is it available in any department stores?